USA, Washington, Red Mountain. Hightower Cellars. USA, Washington, Yakima Valley. Wine scenes from the Red Mountain AVA in Eastern Washington. Tim and Kelly Hightower founded Hightower Cellars in 1997 in Woodinville, Washington with a simple philosophy: “Get the best grapes and don’t screw them up.” With their grape supply primarily coming from Red Mountain, the husband and wife co-winemaking team set out to make high quality wine, beginning with their first vintage: 221 cases of Cabernet Sauvignon. Inspired by the raw beauty and exceptional terroir that defines Red Mountain, Tim and Kelly purchased 15 acres at the top of the mountain in 2002 and began lovingly restoring the barn into a winemaking facility. 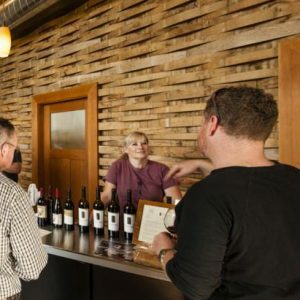 They finished planting their Estate Vineyard in 2005, and expanded and remodeled their winemaking facility to include a tasting room in 2008. Today Tim and Kelly grow 10 acres of Bordeaux varietals, including Cabernet Sauvignon, Merlot, Malbec, Cabernet Franc, and Petit Verdot. They also farm 2 acres of Syrah, Viognier, and Grenache at Jackie Hightower’s (Tim’s Mom) vineyard on Red Mountain. Tim and Kelly are involved in every step of the winemaking process, from supervising the vineyard to harvesting, from fermentation to bottling, in addition to managing the tasting room and sales distribution of the wine. Tim and Kelly aim to make wine that lets the powerful, concentrated fruit from its estate vineyard speak for itself, producing wine with great character, that’s naturally beautiful and free from pretense.